Things happen every day that traumatize children: natural disasters, family violence, and sudden death of a special person. At Child HELP Partnership, we help children and families weather the storms they encounter in today’s world. With the goal of minimizing the negative impact of trauma on children, CHP has developed programs at each point of intervention. Our core prevention program is called KEYS (Keeping Every Youth Safe). This modular series of workshops is designed to give parents and other caregivers who take care of children knowledge and concrete strategies to prevent sexual abuse, physical abuse, and bullying. Our grief-counseling model is Making Connections. This is a 10-session series, with separate co-occurring groups for 5-7 year olds, 8-12 year olds, teenagers, and parents. Making Connections focuses on building relationships and coping skills to minimize the anxiety, sadness, and anger families feel after a death of a loved one. Two therapy models are offered, Trauma-Focused Cognitive-Behavioral Therapy and Alternatives for Families-A Cognitive-Behavioral Therapy. Both models are cognitive behavioral therapies, meaning that the focus is on developing productive strategies to address the physiological, cognitive, and behavioral responses we have to upsetting emotions. They are short-term therapies, meaning that they are typically completed in 6-9 months (16-24 sessions). And all of our programs recognize individual differences – and the importance of the family in children’s development. Every child and every trauma situation are inherently unique. 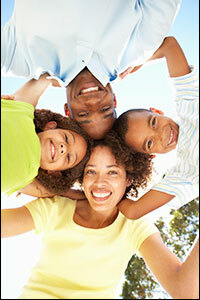 Each child and family member plays a role in the healing process. After participation in KEYS, caregivers know more about how to protect children from abuse and bullying. With grief counseling, children and adults who participate have less anxiety and depression over time, and are less likely to need therapy. Children who have participated in our therapy models show greater decreases in anxiety, depression, and anger/aggression than children who receive other types of therapy. In addition, parents who participate show greater decreases in their own general stress and worries about their children. Whatever type of trauma we encounter, all of these models are informed by science, meaning that the interventions have been shown to work.